I am getting knock retard. Here are the scans and tune. Any ideas. Maybe I haven't had enough coffee this morning, but I didn't see any knock in the log. Just a few throttle stabs and idling. 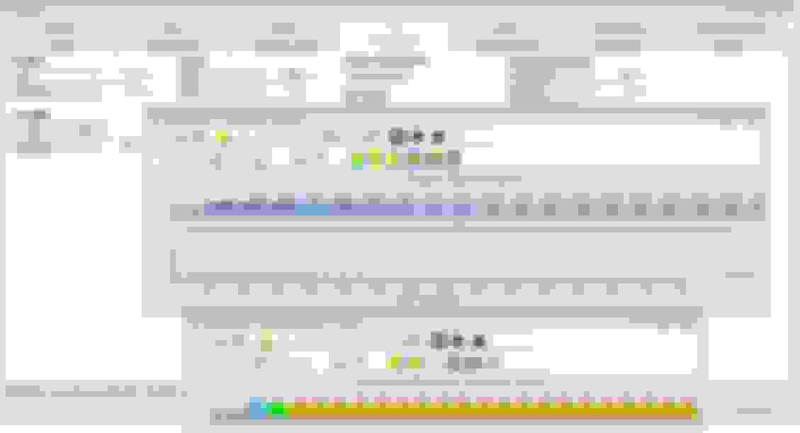 It also looks like you are in speed density because all your trims are off, so I hope you are using a wide band to tune. I didn't see the input for that in the scanner. The one O2 that's working seems to be very lean. I exported this log file to a CSV and there is not any knock reported. So... Guess that solves that problem? Here is a short drive. the wide band in on the second line on the charts and time and histogram. The narrow band was removed from scanner now. Last edited by shock69; 04-14-2019 at 10:25 AM. I'm having a tough time figuring out your WB setup. What input are you using to get it in the scanner? Serial data? USB? Or is it the "O2 voltage"? It seems really lean and non responsive if that's the one. Is this a MPVI Pro or do you have to use another input like the A/C pressure switch? 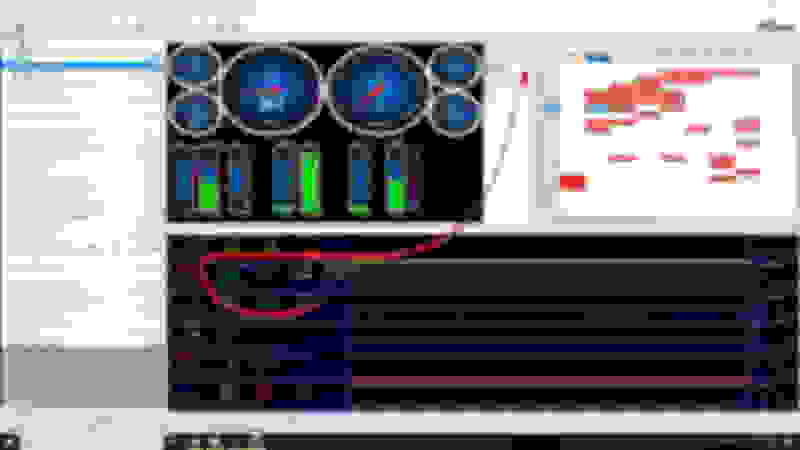 So I took a look at your fueling, and maybe I'll go through the rest of the tune later, but the first thing I noticed is you are maxing out on your MAP at like 60% throttle, 3k rpm, which tells me that you have boost (or a serous electrical problem lol). Your tune is a 3 bar setup, so that makes sense too, but the part where your MAP is maxing out does not. Did you change the MAP sensor itself to a 3 bar? Going by the log, it appears to be a 1 bar stock sensor. It never gets above 105. Take the 105 row, from your table and copy it to the 315 row. Then multiply that row by 2. (1.5 if it's a 2 bar, etc) After that, interpolate on vertical bounds. 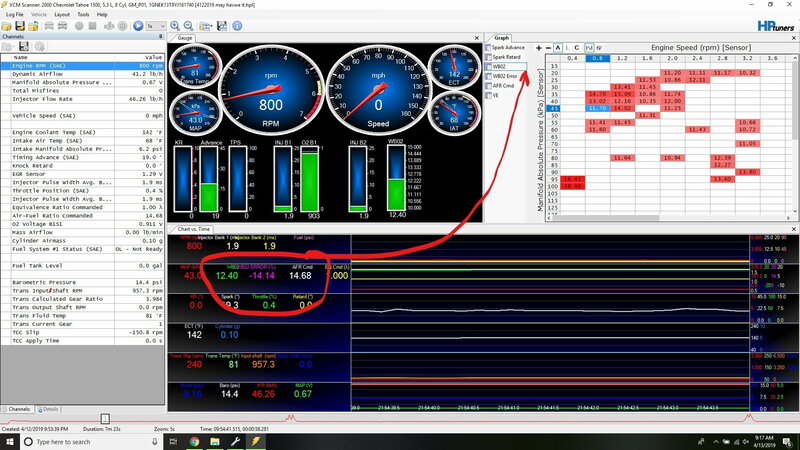 A lot of guys will disable boost, however that works on your setup, and then tune the VE normal, up to 105, then do what is shown above and then continue tuning into boost. Up to you, but you definitely need to have some much higher numbers up top there. I also have to ask, is this tune scaled? You have 46# injectors according to your flow rate, which isn't much for a 3 bar boosted car. Is this thing staying on pump gas? Oh, and your burst knock is still enabled too. Might be worth turning that off too. Just max the table out. Stock settings are really low. I have 80# ford injectors on 93 octane. When i raise the numbers in the VE up tom100 and 3000k it runs super rich and rough. Where do i raise the mil gram up at? It's under the transient fueling tab. So basically this is scaled. I thought so lol. That's where you start if scaling a tune. Definitely get the MAP fixed, and get that fueling under control +/- 5% (or better) on your VE. Hopefully that takes care of some of that knock. Also do the usual checks, and make sure it's real too. That can really drive you nuts. Easiest way to check is some race gas. Put some 110 in there and if it still knocks at 8* of spark and proper fuel, there's no way its real. That's when you go ahead and tune the sensors down a bit on sensitivity (toughen em' up) lol. But yes, false knock is a thing too. Even a noisy drive train, exhaust, suspension or something touching the block, etc, can set them off and drive you crazy. Been there. Done that. It is on soild motor mounts. I will try that next. I will reload this yune and give it a try. Again Thanks You so very much. Do you know any way to test the map or to check with out pulling it? Voltage signal or something. I have the 80# deka injectors. What should i set the injector flow rates at? I have a meth system on the car not active yet. Iplan on staying 93 octane for now. 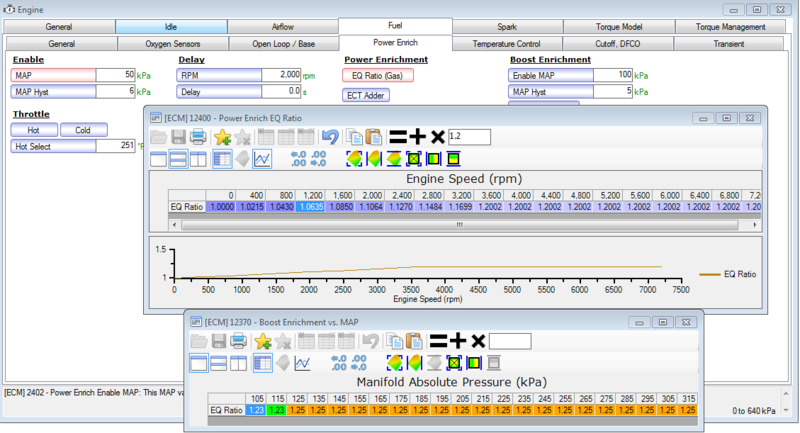 Ok added the 80#injector data to the tune and changed ve. When the car is running i open the throttle plate it stalls and when it closes it runs again. I have attached the scan and tune. 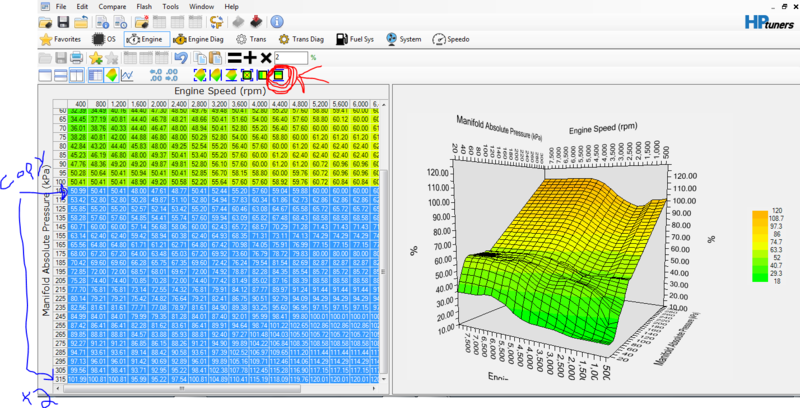 You can leave the flow rate alone, or reduce your VE accordingly. In fact, once you have the data in, then you can reduce it by % to whatever you want it to be, as long as you adjust other parts of the tune along with it. It's called scaling. Sorry if that got you confused on what to do to the injectors. Also, if you are using a rail pressure regulator, then it will not have a slope. It's just a set number straight across. Also, so I can add the math to my scanner, what is your user math for your WB? The offset, etc? Should be some user math to convert the voltage to an AFR. Could I get that from you? Oh and solid motor mounts I would assume would probably set of the knock sensors at certain rpms. They are looking for 6400 hrz, in that range, aka metal on metal sounds. I would put in some race gas and then tune the sensors themselves. You still want them to work, so setting them just outside the threshold for the natural noises your engine is going to produce is the way to do it. That's why a few gallons of race gas works wonders for this, yet still leaves them working properly in case you get real knock later on. Obviously get the fueling under control before wasting money on race gas. Everything is on the VE table. Make it smooth without any giant changes from one cell to the next. The smoother the better. I see the new one you posted needs some smoothing or interpolating. I'd go back to your original tune, and go from there. Don't over-complicate it by scaling your tune up. And get that MAP input working, otherwise that will lead to some real trouble if you get on it too hard. Could the map scaling be wrong? i will order a new map too. Put the old tune back in and will smooth the ve table. do you do that by just working the numbers cell by cell? You can use the "compare" feature and just copy the whole table over. I watched your video it was great the best i have seem. I am new to this always a big inch chevy carb guy. Controls engineer for a living. If i knew what tables effected what it would be easier for me lol.